Jasen is a graduate of the prestigious New Orleans Center for Creative Arts (NOCCA) as well as the University of New Orleans. 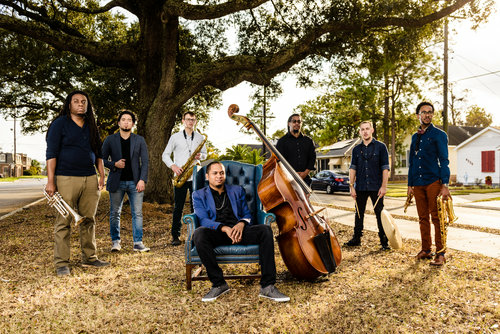 While in high school he was a member of the Tipitina’s Internship Program under the tutelage of the great Donald Harrison, whose band he joined years later. Jasen has toured in Europe, Australia, South Africa, Honduras, Japan and many cities in the United States.As a recording artist, Jasen has performed with Dr. John, Dee Dee Bridgewater, Jason Marsalis, Jesse McBride, David L. Harris and many more. Jasen will present his vibrant compositions from the highly acclaimed CD: “Voscoville”. The quintet features Steve Lands-trumpet, Miles Berry- tenor sax, Zakk Garner- alto sax, Chris Coreil- piano and AJ Hall on drums.